Fun With Frisian: TSJUSTER - "dark"
Here's a sound we don't see often at the beginning of words in English. Tsjuster, "dark" or "darkness," begins with a sound like a t- in front of the word "chew" and ends with a syllable like the word "stir." TCHEW-stuhr. It bern is bang by tsjuster. It means "the" or "it." As discussed previously, this word is pronounced with a schwa. UHt, rhyming with "hut." Bern means "child" and apparently is pronounced with a "eh" vowel, like in the past-tense "been" (American, not British, pronunciation). BEHn. 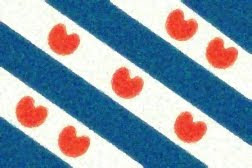 If you click on the link, you can see Frisian Wikipedia's entry on different kinds of children: babies, toddlers, etc. Is is like "is" in English. Bang is pronounced with the long "ah" in "father" and not like the American English word that looks the same. It means "timid, afraid, or concerned." However, a loud bang could certainly make a person afraid. BAHng. According to P. Sipma's glossary, by is supposedly pronounced like the word "bay" and means "at, near, or with." However, that transcription is from a century ago. In modern usage it actually seems to be pronounced just like the English word "by."